St. Mary’s School has strong links with St. Mary’s Church, Twickenham. Our school chaplain is Father Piotr, who carries out weekly collective worships on all three sites. The school actively uses the church for celebrations throughout the year. My name is Piotr Ashwin-Siejkowski and I am a half-time assistant priest at St Mary’s Church (Twickenham) and the chaplain to St Mary’s School. I was born and brought up in Poland. I previously worked as a team-vicar in Richmond. I am delighted to continue my ministry to St Mary’s School, which I know quite well as our daughter attends Junior Site. My pastoral ministry to the parish and school is combined with my academic work at King’s College London (Department of Theology and Religious Studies). With your help as parents I hope to develop a creative approach to prayer through Messy Church so please watch the space! Father Jeff Hopkin Williams started life in Llanelli, Wales, where he attended a primary school very similar to St Mary’s, followed by a local Secondary school. A degree in English and Drama at the University of Wales in Aberystwyth preluded his spiritual path in life. After his degree, Jeff became involved in the “Give a Year to God” programme which allowed him to invest time carrying out pastoral work within a church community based in Sussex . Inspired by this work, Jeff then attended Chichester Theological College, which was affilliated to Southampton University, and completed a Theology degree. 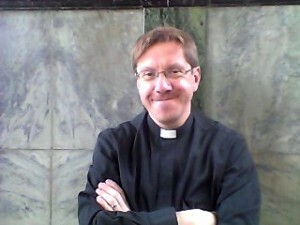 On completion of his studies, Father Jeff took up his first official post within the Church as Assistant Curate in Eastbourne. He progressed to the role of Rector at Upper St Leonards near Hastings where he was Chaplain to a hospice for 8 years. The parish of St Mary’s, Twickenham, welcomed Jeff as our Vicar in March 2002. Father Jeff is a vibrant and welcoming figure in the life of the children at school, seeing each child as an individual. Through regular assemblies in school, and opening the Church doors to the parents, friends and families of our children, Father Jeff has become an integral part of our small community, and enriched it for all. Father Jeff also works with other Trustees at St Mary’s to secure a solid financial foundation for our school to carry on growing and thriving into the future. During his spare time, he also enjoys writing short stories, collecting Art, and listening to Jazz music. The “X Factor” is one of Father Jeff’s favourite TV programmes, and by his own admission he is totally addicted! His pet black Labrador, Muddle, (Mudd for short) accompanies him for long walks around Twickenham or the Sussex countryside. The Senior Leadership Team are responsible for pastoral care throughout the school. In addition to this, all teaching assistants embrace the caring and nurturing aspects of school life.